About - At Home Real Estate Services, Inc. If you are looking to purchase a home, put your home on the market or hire a professional Realtor & Property Manager, your search is over. Our Mission is to provide outstanding service through integrity and professionalism, applying industry wide best practices and ethical standards with common sense. We utilize state of the art technology to maximize efficiency using mobile communication with owners and residents, as well as maximizing the visibility of our marketing, to ensure the accuracy of our property information. We understand local knowledge is the key in driving maximum property performance and we work proactively to be the experts in our field. This allows us to respond quickly and effectively to a constantly changing market. "We offer a personal touch to all our clients. You are not just a number to us, you are part of our family." As a Realtor, there is a higher standard for sales and property management. Your property will also be listed on the Realtors’ Multiple Listing System(MLS), a proven system with over 20 years of experience. Our mission is to provide outstanding service through integrity and professionalism, applying industry wide best practices and ethical standards. We offer an exceptional degree of customer service that is based on mutual trust and respect. We are focused on providing you with the most personal attention and the best service possible. 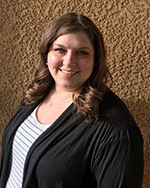 Danielle started in the Real Estate field with Property Management in 1993 and has been working in the Colorado Springs area since 2001 as a licensed Realtor and Property Manager. She knows how to help you with your unique needs to protect your investment. We're proud to be an independent family company that cares about doing the job right! She also enjoys spending time with her husband, children and becoming a Grandma this spring. When working with At Home Real Estate Services, Inc., you're not just a number, the personal attention and communication will surpass your expectations. Fully licensed and Insured with the State of Colorado, you can rest assured we can service all your real estate needs. Not all Real Estate Agents are Realtors. Danielle has earned her Residential Management Professional (RMP®) with the National Association of Residential Property Managers. 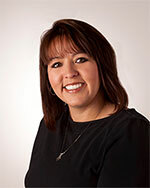 Megan L. is a property manager with more than 14 years’ experience in residential and commercial property management. As property manager, Megan oversees all aspects of leasing properties, marketing, preparing leases, reports, showings, and inspections both interior and exterior. Megan got her start in the property management industry with multifamily residential in 2004. She later transitioned into single family residential property management. Megan holds a Colorado real estate broker’s license. Megan’s objectives are to expand her knowledge and seek higher career goals in the property management field. Megan has grown up in Colorado Springs and is very familiar with the area.